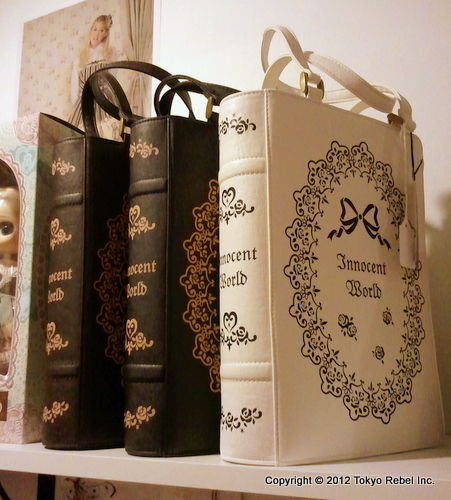 Tokyo Rebel: New Innocent World items, including book bags! New Innocent World items, including book bags! The last thing we have to tell you about today is probably the most exciting: to coincide with our announcement of our upcoming interview with Innocent World designer Yumi Fujiwara, we just received new Innocent World items, including their new Rose Lace Book bags! IW's Antique Book Bags are some of the most popular items we've had, and while that series is no longer in production, we did receive some of their new Rose Lace Book Bags! These have a similar design but a different print than the earlier Antique Book Bags. 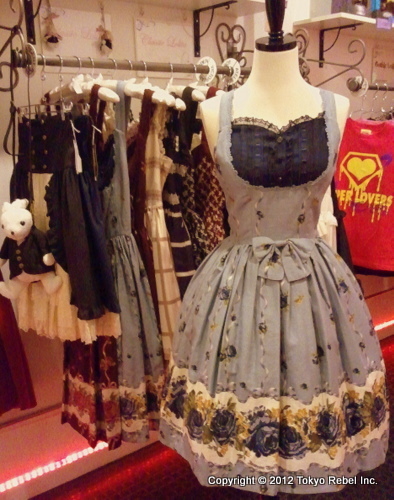 Of course we also received new skirts and dresses, some of which you can see in the photo at the top! (Sorry about the cell phone pic quality!) That is the Bertille Rose jumper skirt in navy/short - we also have this in long, as well as in Bordeaux in both short and long, and we've got the matching socks too. If you like the navy dress but aren't sure what kind of headgear to match with it, we now have the Miranda headdress in navy as well. We also restocked the Heart Scallop Umbrellas, which will hopefully be around long enough this time for us to get them back up on our web site - we last restocked them just before Christmas and they sold out quickly. And we can't forget to mention the brand new Napoleon Skirt (link goes to IW's web site), which is so beautiful we just had to get it! It may take us a couple of days to post everything to our site (for IW, we need to take our own pictures), but here is the list in the meantime - and it's all available in our store right now. Don't forget to send us those questions for the Q&A with Yumi Fujiwara! Finally! KERA 162, 163 and GLB 42 on the site! New Pullip stock, including Milky Rail Train!